A price has been agreed for a community buy out of a 93,000 acre estate in the Western Isles. 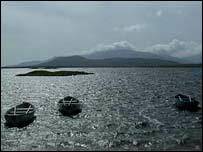 The fee of £4.5m has been set for the sprawling South Uist Estate which includes Eriskay and part of Benbecula. Most of the money is expected to raised from Highlands and Islands Enterprise and the Scottish Land Fund. However, the community company set up to take over the estate is to launch a world-wide appeal to raise its share of the cost. The estate, which is owned by a syndicate, represents almost a quarter of the Western Isles. In 2005, a ballot of the community secured a 70% majority in support of proceeding with the purchase. As well as 850 crofts, the estate includes fish farming operations, quarries and potentially lucrative shooting, mineral and fishing rights.